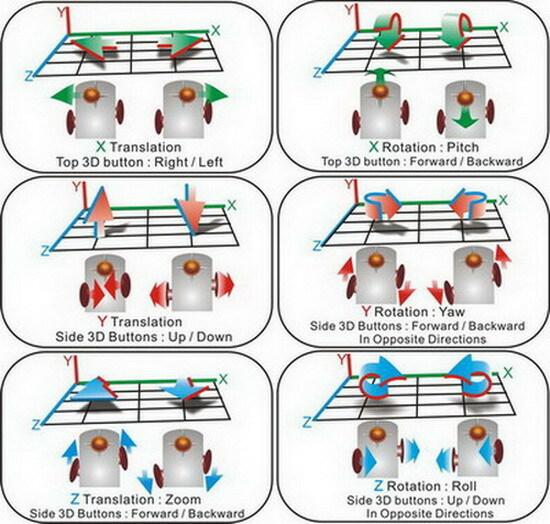 3-D movement (with 6 degrees of freedom) instead of the usual 2-D of most mice. Programmable keys to adapt to your specific needs. An attachable wrist support to prevent your wrist from sliding on your mousing surface. The ability to change the DPI on the fly. Efficient design - The design of the 3D Game O2 allows the user to make complex movements with the mouse alone, so that the user is not required to reach constantly for the keyboard. Because of this, the range of movement required by the user is much less, reducing strain on the arm and hand. Palm support - The 3D Game O2 provides some relief for your wrist with its attachable wrist support. Instead of dragging the wrist on your mousing surface, it can rest comfortably without producing excessive drag on your mousing movements (due to the teflon sliding pads on the underside). 6 degrees of freedom: The 3D Game O2 gives you 6 degrees of freedom to move objects in three dimensions. PC users can now move forward, backward, sideways, yaw, pitch, jump, and crouch without using the keyboard. To see a graphical chart of the different movements, click here. Programmable key functions: The 16 functions associated with the three buttons (thumbsticks) and scroll wheel are also programmable to your specific needs. This comes in handy when you don't want to use any of the preprogrammed layouts available for the 3D Sandio O2. This versatility of the programmable functions makes the mouse adaptable to different applications, whether they are different games or word-processing and/or autoCAD software. Removable ergonomic palm support: An attachable wrist support that connects to the back of the mouse prevents your wrist and forearm from dragging on the desk surface. The support itself has a teflon pad on the underside to facilitate smooth movement. This support thus gives relief to your wrist while also making your arm movements more fluid with less resistance. DPI changeable on the fly: The Sandio 3D Game O2 also has 4 available DPI settings (400, 800, 1600, and 2000) that can be changed on the fly. Audible feedback lets you know when this change has been made, and so even less interruption is needed when concentrating on the movements in your 3-D applications.